2. Sean Smith - What once was will be. 3. Sean Smith - Die until tomorrow, sleep. 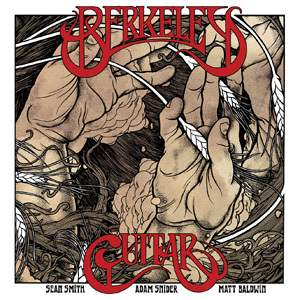 Berkeley Guitar is a collection of new recordings by three of the Bay Area’s finest young acoustic guitarists: Sean Smith, Adam Snider, and Matt Baldwin. The city of Berkeley and the acoustic guitar share a rich, decades-long history — most notably as the Sixties home base of Takoma Records, which released landmark recordings by John Fahey, Robbie Basho, Leo Kottke and many others. This history inspired three young guitarists from the Bay Area to create a document of the present-day guitar scene. Produced by Sean Smith and recorded and mastered at Fantasy Studios in Berkeley, CA, the package includes liner notes by Larry Kelp of Berkeley public radio station KPFA and Ed Denson, co-founder of Takoma Records. The album is available on CD and gorgeous limited edition deluxe gatefold vinyl.